by James R. McCaul, President IMA Associates, Inc. The Outlook For U.S. Navy Shipbuilding and Ship Repair Sales of equipment and services to the U.S. Navy continue to be the major source of business for marine equipment manufacturers. The U.S.
Navy represents an annual sales market totaling $35.0 billion—excluding aircraft procurement, personnel and other non-relevant expenditures. Despite recent efforts to cut the growth of overall defense expenditures, the Navy maintains a strong position. There continues to be tremendous opportunities for increased product, sales and market expansion as a result of the huge amount of business generated by the Navy ongoing purchases. OVERALL DEFENSE BUDGET In January, President Reagan submitted a defense budget request for $315.2 billion in FY 1990 and $330.8 billion in FY 1991. This represents a rate of increase of about 5 percent per year over current spending— or 2 percent per year if inflation is taken into account. Details for budget authority and outlays are shown in Exhibit 1. P r e s i d e n t Bush will make changes to this budget request, which likely will result in a reduction in proposed overall defense spending and stretch-out of some major programs. These changes are not known at time of publication. NAVY BUDGET The proposed Navy budget is $101.7 billion in FY 1990 and $105.1. billion in FY 1991. This would represent a three to four percent increase over current spending. Described below are Navy's plans and budget for major program activities over the next several years. SHIPBUILDING Navy has requested $10.4 billion in FY 1990 to fund construction of 20 new ships and two major conversions. The amount of $9.8 billion is requested in FY 1991 to build 14 ships—including two follow ships in the SSN 21 attack submarine program. Exhibit 2 shows a ten-year pattern of spending for ship construction. One column shows total obligational authority—the figure which essentially sets the limit on the agency's contractual authority. The other column shows the actual outlays in each year—representing pay- ments to contractors for ships and equipment. Outlays best indicate the level of business activity generated by Navy spending. As shown, outlays will grow from $8.9 billion in FY 1988 to $10.9 billion in FY 1991. This growth occurs despite the fact that obligational authority is much lower in FY 1991 than FY 1988. Shown in Exhibit 3 is the breakdown of the shipbuilding budget request for the FY 1988-1991 period. Exhibit 4 shows the projected program over the next five years. A major change in the future program has been the deletion of three SSN 688 submarines originally planned for FY 1991 and 1992. There had been criticism of Navy's plan to overlap construction of the SSN 21 and SSN 688. The current plan is now to end the SSN 688 program in FY 1990. In FY 1991 Navy plans to order two SSN 21's and maintain a construction rate of three per year thereafter. Navy plans to build DDG 51 Aegis destroyers at the rate of five per year over the next five years. This program is a target for budget cutting— most likely by stretch-out— building fewer ships per year over a longer period. Other changes from last year's plan include a change in timing for several programs—including the AOE fast combat support ship, LHD amphibious assault ship and TAGOS survelliance ship. Three MCM mine countermeasure ships have been added for FY 1990. SHIP REPAIR Expenditures for ship maintenance are projected to increase over the next two years. Navy plans to spend $5.2 billion in FY 1990 and $5.4 billion in FY 1991 for active fleet ship maintenance and modernization. These figures compare with projected spending of $4.7 million for ship maintenance and modernization in FY 1989. Details are shown in Exhibit 5. In addition, $208.0 million is to be spent on reserve fleet ship maintenance in FY 1990—vs. $199.0 million in FY 1989. Despite the planned increase in funding for ship maintenance, the number of planned availabilities is projected to significantly decline over the next two years. In FY 1989, Navy has scheduled 149 availabilities of active fleet ships. This figure is projected to rise to 154 in FY 1990—and then fall to 128 in FY 1991. The number of ship overhauls will decline from 25 in FY 1989 to 15 in FY 1990 and 12 in FY 1991. Compared to this year, the number of short term planned availabilities will increase somewhat in FY 1990 but decline significantly in FY 1991. Major factors driving projected ship overhaul spending are two carrier overhauls. A regular carrier overhaul is scheduled in FY 1990. A major refueling overhaul is scheduled for the nuclear carrier Enterprise (CVN 65) in FY 1991. These two work starts will consume a substantial portion of the overhaul budget. As a consequence, a rising budget will not result in corresponding additional work opportunities. 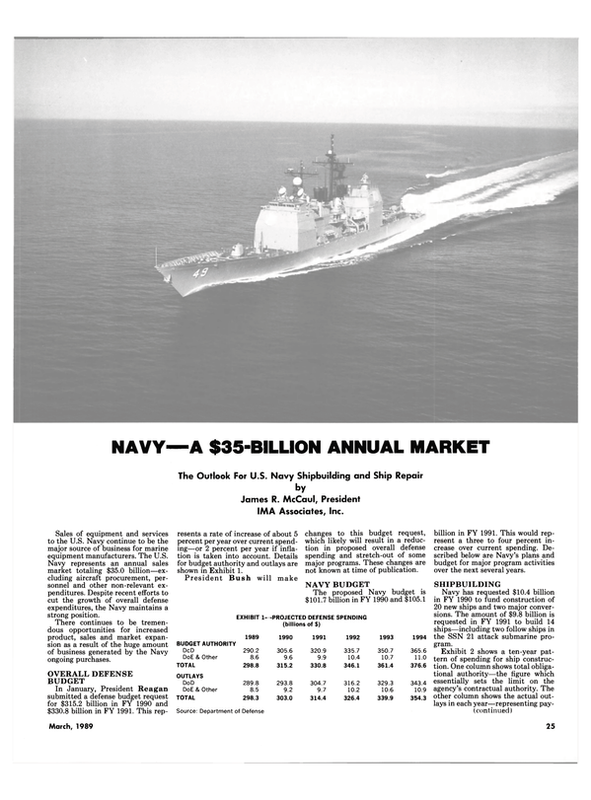 OTHER PROCUREMENT AND ENGINEERING PROGRAMS Navy spending for "other procurement" is projected to be $4.7 billion in FY 1989. This figure is projected to rise to $5.0 billion in FY 1990 and $5.7 billion in FY 1991. The major reason for the increase is additional funding for communications and electronics equipment. Much of the increase is the result of major initiatives associated with submarine modernization programs. Funding of research, development, test and evaluation (RDT&E) is projected to grow f r om $9.3 billion in FY 1989 to $10.2 billion in FY 1990. Much of t h e increase is associated with increased spending for tactical programs which are entering full scale engineering development. MILITARY CONSTRUCTION The Navy budget for military construction will decline from $1.6 billion in FY 1989 to $1.1 billion in FY 1990. The FY 1990 request cont a i n s funding for the strategic homeporting initiative—including $30.9 million for developing the New York homeport, $33.5 million for Gulf Coast sites and $20.3 million for t h e Everett homeport. However, a recent recommendation of t h e Base Closure Commission will likely result in lowered funding for Gulf Coast sites.